Costing is an important fact in garments manufacturing sector. Whole business is totally depends on it. Accurate costing can increase the growth of a business. 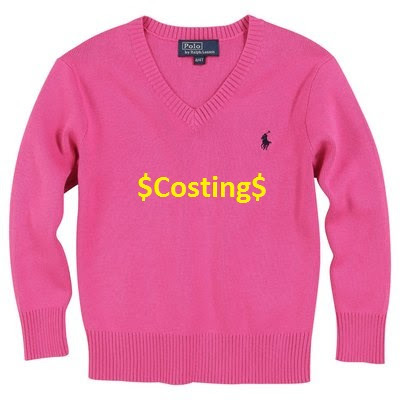 As its importance in garments merchandising, today I will present sweater costing calculation method in this article. The very next duty of a sweater garments merchandiser is to determine the yarn consumption and costing. Generally we have added 10-20% wastage depends on styling. In this stage, all the others necessary cost should be added with total yarn cost to achieve total cost of a garment. Now, one example is presented in the below to clear all the confusion about the above discussion. Specifications: Plain knit placket, 2 pockets. Now, find out the garments costing of the above order. By adding all the following costs with total yarn cost, we will get the total FOB cost of garments per dozen. In buying house costing, profit% for the buying house (here-20%) should be added with total FOB cost per dozen. This article only shows the sweater costing calculation method. Don’t be disappointed about its result. All the numbered used here for completing the calculation only. So, please, don’t make any comment about the calculating result. You can pass your comment, advice just about the calculating method. in our buying house we convert grm to lbs divide by 37.8 .